This t-shirt is just about some silly humor. 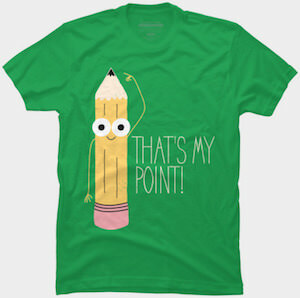 On the t-shirt you can see a pencil and it has a face and arms and on of those arms points to the tip of the pencil and then you find the text “That’s My Point” next to it witch of course is kinda of funny. You can get this t-shirt in styles from men, women and kids so that the whole family can enjoy wearing this silly t-shirt and the t-shirt comes in many fun colors to so that you can have a different color for everyday of the week.